They tried all of the traditional marketing strategies of course: flyers, magazines, and door drops. None of them even compared to the impact that got from getting to the top of Google. Although they had two prime locations in West London and got good walk-in traffic they were not achieving any success on the internet. They had a nice website but it lacked optimization and as a consequence they got little traffic from the internet. 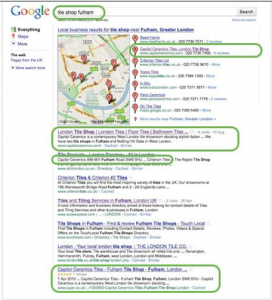 To get both showrooms on the first page of Google places (non paid results) and to ensure a more comprehensive listing of the company’s details are reflected in each of the leading directories. 2. Website design – Complete an onsite optimization plan which included focusing on terms that maximized traffic which resulted in new customers. 3. 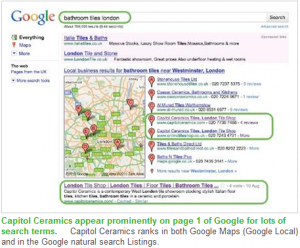 Google Places optimization – Claim Capitol Ceramics business listing on Google Places, optimize it for search terms, and provide more comprehensive information for the listing. 5. Customer reviews – Educate the staff on the power of soliciting customer reviews; securing over 15 online reviews to boost word of mouth and directory rankings. I’m a busy store manager; I just don’t have time to deal with online marketing. The results are excellent.